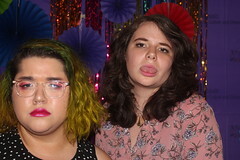 UMBC Women Who Rock is a blog series I’ve been writing since last year and it has become one of my favorite things to think and write about for the Women’s Center blog. 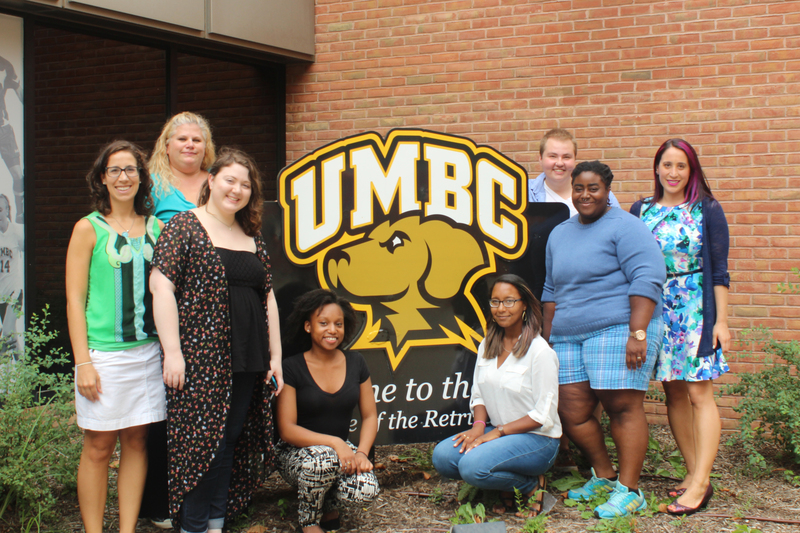 In my role as Women’s Center director, I have some of the best opportunities to become acquainted with some of UMBC’s best and brightest women on campus. I admire the ways they live authentic lives unapologetically that challenge the stereotypes and assumptions that are often assigned to women. By debunking these stereotypes and forcing us to check our assumptions, they allow us to expand our notion of what a woman is and can be. The Staff of Color Network co-chairs =Women who ROCK! to hearing. Intrinsically, I politely answer with, “Yes, I am in a sorority” and disregard the latter microaggressive statement, while thinking to myself what does a sorority girl look like? 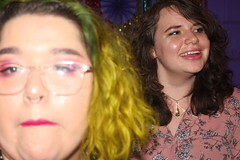 With such encounters occurring more frequently as I approach my one-year anniversary of being in a sorority, I’ve begun to think more about “what a sorority girl looks like.” Specifically, I’ve begun to think about what it means to be a woman of color in what seems to be a predominantly white subculture. A lot of TV shows and movies portray only one side of Greek life and I suppose this is where a lot of these stereotypes are perpetuated; of course, it also doesn’t help that 99% of the images found on a Google image search of for “sorority girl” are white blondes and brunettes “sorority-squatting” behind their letters. Oh, and don’t get me started on that viral “recruitment” video a sorority at the University of Alabama thought it was a good idea to share. I watched the Republican debate twice. Yes. That is six hours of my life I spent listening, analyzing, and forming my own opinions about the candidates. I went in with some preconceived notions. I knew any talk about Planned Parenthood would make me upset because this group of people fail to acknowledge what Planned Parenthood does for women who do not have access to gynecological care. I was surprised when Donald Trump said he believes we need to spread out the vaccinations that children get because I feel the same way, but I’ll save that post for another day. I was hoping to see Carly Fiorina carry the torch for women, but she let me down. In case you missed last night’s roundtable on White Womanhood and Critical Whiteness (or if you were there and want to keep the conversation going), I thought it might be useful to share some resources that have helped me on my ongoing journey of what it means to be a white woman and how I show up and impact those around me as a white woman. As I mentioned, white women need to “hold up the mirror” for ourselves and engage with our reflection of whiteness and white privilege. Having resources and community to help hold up the mirror for us and work through what we see is vital as we engage in this self-work. Below are (just) some resources I’ve found helpful and transformative in my journey. This is not an exhaustive list so I welcome suggestions as well! 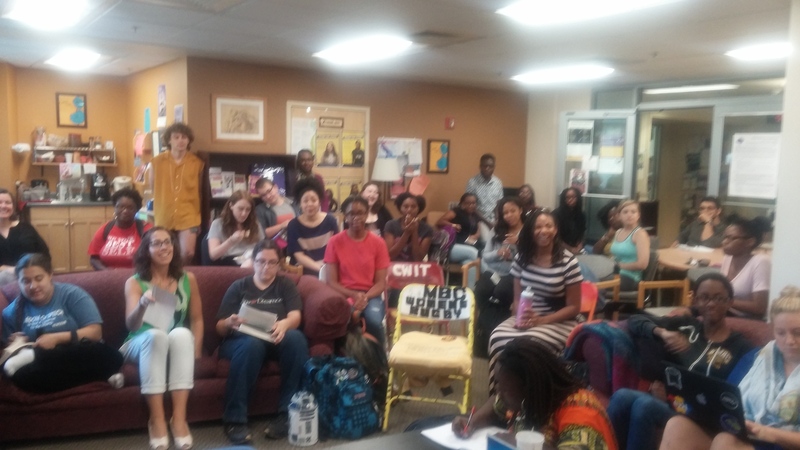 It was standing room only at last night’s roundtable on White Womanhood and Critical Whiteness! We can’t stop here, though, white women, let’s keep the conversation and learning going! Where My Inclusive Dawgs At? — A reflection on American sports culture. A blog reflection written by Women’s Center staff member Kayla Smith. Society tells us that women are too sensitive. We’re crazy emotional creatures who are fragile and people need to tiptoe around us and our sensitive flower petal feelings. Because of this stereotype, I spend a lot of time unpacking my issues with certain comments, blog posts, statements and phrases. Is something truly offensive or am I just being a baby? Is something harmful or am I overreacting? Recently, I attended the first soccer game of the season here at UMBC. I’m not typically a big sports person but I really like sporting events because of the sense of community, which is especially important at UMBC since we’re often seen as lacking in the school spirit department. Meet the 2015-16 Women’s Center Staff! 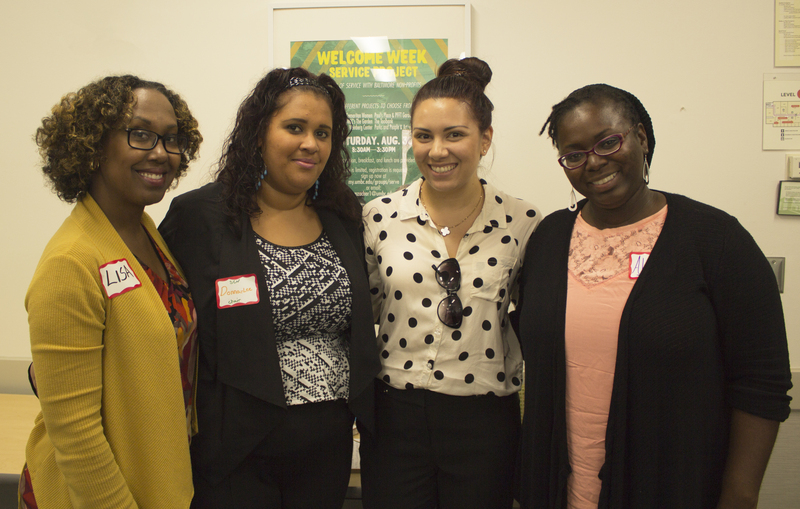 Get to know the Women’s Center’s new team of staff and interns! Hi! My name is Meagé, and I am a new staff member in the Women’s Center. 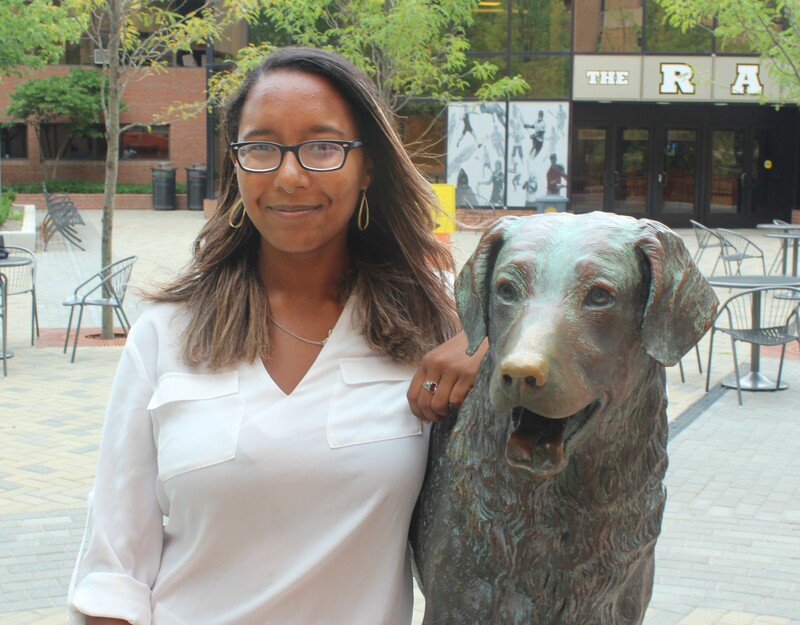 I am currently a senior studying Psychology and Social Work, as well as a member of UMBC’s Honors College. I am a social work intern at Delrey School, where I will be working with children and adolescents with cerebral palsy, among other physical and intellectual disabilities. After college, I hope to earn my MSW and find a career where I can help marginalized and oppressed people thrive in our society. In addition to being a staff member in UMBC’s Women’s Center, I am a member of Zeta Sigma Chi Multicultural Sorority Inc. In my spare time, I enjoy yoga, reading, listening to music and creative writing. This semester, I am excited to learn and become more involved in the efforts of the Women’s Center. If you happen to see me in the Women’s Center or around campus, feel free to say hello! I am looking forward to meeting new people and engaging in some thoughtful dialogues! My name is Carrie. I am BEYOND excited to be starting my last year at UMBC. I will graduate in May with a degree in social work after being in college for ten years. Yep. That is NOT a typo. Ten FREAKING years. See, I have three daughters and they keep me incredibly busy and because of that I decided that part time was the way to be. I think we will all be doing a happy dance when I graduate. Beyond that, I am involved with the BreakingGround initiative on campus as a member of the Community Program Grant Committee. I also am a member of the Leadership Advisory Committee. I am also super proud to be a Return Women’s Scholar. It was my membership in that group that first brought me to the Women’s Center and that has been such a source of support for me as I took the long and windy road to graduation. Other that that, I am a wife, a friend, a chick from New Jersey, a lover off all things pop culture and a huge fan of They Might Be Giants. Hey there! I’m Julia, and I’m a new student staff member at the Women’s Center. I’m interning with the Women’s Center through the GWST Department, and I couldn’t be more excited to dive in. I realized that I wanted to pursue Gender & Women’s Studies as a major three years ago after overhearing a conversation in which two people victim-blamed and shamed women for choosing to get abortions. Looking back, I felt so angry and defensive of women, which made me realize that this was an issue I cared deeply about and needed to investigate further. The Women’s Center is the perfect way to translate my passion for feminism and social justice into a tangible job that challenges me to think critically and to push myself–all while in pursuit of greater social and political change through activism. I’m a senior majoring in Gender & Women’s Studies and minoring in Critical Sexuality Studies. I’m also a co-leader for Women Involved in Learning and Leadership (WILL) and I’m pumped for the new semester! Singing and listening to music are by far my favorite things to do; I took piano lessons for ten years and have been singing all my life. My favorite artists currently are Lianne la Havas and Alabama Shakes. If you see me feel free to say hello (and tell me what music you’re into)! Hey! I’m MJ Jalloh-Jamboria. I am currently a Gender/Women Studies and Interdisciplinary Studies (Pathology) double major. My minor is Critical Sexuality. This is my second year at UMBC and my first year as a student stuff member here at the Women’s Center. In addition to that, I am the Director of Events of the Council of Majors/Minors. Finally, I am the Music Director of UMBC’s newest a Capella group, the Culture Chords. I know it may sound like a lot but I enjoy staying busy and contributing to the UMBC community! My favorite thing to do, besides singing and eating, is to look at how my identities come into play as I interact with the world around me. As a fat, non-binary, first generation West African Immigrant, Muslim person, I have a lot to think about! Hi! My name is Kayla Smith. I’m a pre-law junior majoring in Interdisciplinary Studies focusing in health education. I’m a third semester peer health educator with a special interest in sexual health and I’m Vice President of the Mock-Trial team wherein I act as both an attorney and a witness. I’m really bad at introductory type things (even in the age of online dating, Facebook, and sure lets say Myspace). The words “About me” or “tell us about yourself!” have always been really intimidating, so I’m going to take a page out of past Women’s Center staff member, Amelia Meman’s book, and adopt the bullet point system. I identify as Queer (Ask what I mean by that!). I’m West Indian. My favorite music genre is instrumental progressive metal. Hey everyone! My name is Dan and I am a junior GWST major. I joined the Women’s Center staff last year and I am so excited to be back again as the senior staff member. You’ll see me around a lot because I never actually leave the Center. I am the peer facilitator for Spectrum and Rebuilding Manhood, and I’m very involved with the LGBTQIA+ community here. I love answering questions! 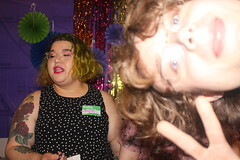 If you want to have a discussion about or have questions about gender, sexuality, sexual health, polyamory, fiber crafts, cats, or Steven Universe, I’m your guy! I live by the idea that everyone has the capacity for good and every interaction can be a learning moment. Being at the Women’s Center feels like not only a home away from home, but the place where I have learned how to be the best version of me. I really hope the Center can be these things for everyone, and I do my best to facilitate that here. If you need anything, please ask! I’m very excited to meet you all. I’m an unapologetic feminist and woman of color. I’m not your model minority. I’m an introvert. I’m not always angry. I’m Team Nicki. I’m a cat lady. I’m a queer femme. I’m not ashamed of my love of boy bands. I’m an advocate for critical social justice. I’m a picky eater. I’m not a fan of Maryland’s humidity. I’m looking forward to another great year at the Women’s Center! Wow-wee, where do I begin?! Today I logged into my LinkedIn account because I got an alert that someone was looking at my profile… who was checking me out?! I had to know. Long story short, I found myself skimming through my profile and was alerted to the fact that I have been Director of the Women’s Center at UMBC for 4 years and 6 months. How lucky am I?! I have learned and grown as a professional, as a feminist, and as a person so much since I first arrived here at UMBC. I have gotten to work with some of UMBC’s brightest and most courageous students. I’ve learned how to insert gifs into emails and how to tweet on the Twitter. I’ve been challenged and held accountable to expand my notions of feminism beyond “white feminism” and to boldly live out my social justice values in a critical way. Moreover, I get to work in a place where I am authentically me. I love being silly. I relish in the opportunity to use Leslie Knope gifs as a mode of communication. I identify as a queer lesbian and deserve medals for my fierceness in spin class. I approach my work from my collegiate background in social work and identify as a student affairs professional. I’ve lived in Washington, D.C., Kingston, Jamaica, and Fort Collins, Colorado but Baltimore is my hometown. It is a city that forever is rooted in my heart and very being. I also really love my introduction from last year and want to share it again (I’m a big fan of also not recreating the wheel!). You’ll find me on here most often blogging through my UMBC Women Who Rocks series and other Women’s Center confessions I like to make public. Basically and most importantly, I love my job… I’m looking forward to a year full of challenges, successes, and learning opportunities!